If you have been injured in a bicycle accident, you need answers about who will be paying your medical bills, who will help you recover from the injuries you have sustained, and who will pay for damage to your bicycle. We are experts at handling bicycle accident cases, and can help you with every aspect of the difficulties you face after a serious bicycle accident. The bicycle accident injury lawyers at Breakstone, White & Gluck, P.C., have extensive experience handling personal injury claims and wrongful death lawsuits on behalf of injured bicyclists and their families. 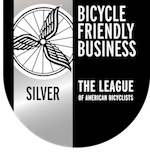 We are committed to the bicycling community. We don't just help injured cyclists; we are devoted to promoting safety and advocacy for cyclists. Through our Project KidSafe campaign, we have donated over 25,000 bicycle helmets across Massachusetts. Not every bicycle accident involves a motor vehicle. We have represented cyclists who have been injured by dog attacks and defective bike parts. But more often than not, cyclists are injured in collisions with motor vehicles which are caused by the driver's negligence. The driver may have failed to keep a proper look-out, misjudged the bike’s speed, turned improperly, failed to yield the right-of-way, or failed to leave the proper amount of room for the cyclist. These accidents can be very serious, resulting in bone fractures, head injury, scarring and even wrongful death. Truck crashes have injured and killed numerous cyclists in Boston and Cambridge in recent years. After these tragedies, our firm has worked to protect our clients' rights, investigated crashes and when necessary, filed wrongful death lawsuits against trucking companies to obtain compensation and justice for clients. Dooring accidents – when drivers open car doors onto the path of cyclists – also cause many injuries. Dooring is against the law in Massachusetts, but drivers are often negligent. As a result, dooring is the cause of about 20 percent of all bicycle accidents in Cambridge alone, according to the city's Community Development Department. Bicycle accidents causing head injuries can lead to traumatic brain injury and permanent impairment. Our attorneys have extensive experience representing cyclists who have suffered head injuries, recovering millions of dollars in compensation to assist them with short- and long-term financial needs. Motor vehicle liability insurance from the responsible driver, as well as the insurance on a car owned by the bicyclist or a family member, are all sources of insurance to help pay for personal injury claims. When a cyclist is killed by someone else's negligence, our attorneys can pursue a wrongful death claim for your family and punitive damages may be awarded. Read our Bicycle Accident Case Reports to learn about our work for cyclists. If you have been injured, learn your rights. Call us for a free legal consultation at 800-379-1244 or 617-723-7676. You can also use our contact form. Source: Boston Cyclists Safety Report 2013, page 20. Data reported by Boston Police Department, Boston Bikes and Boston EMS. Breakstone, White & Gluck, P.C., is a proud supporter of cycling and cycling safety programs in Massachusetts. 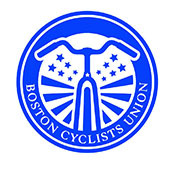 We support the Northeast Bicycle Club, the Charles River Wheelmen, Bikes Not Bombs, New England Mountain Bike Association, Boston Cyclists Union and MassBike. In 2013, we launched our Project KidSafe campaign to help protect children on bikes from head injuries. 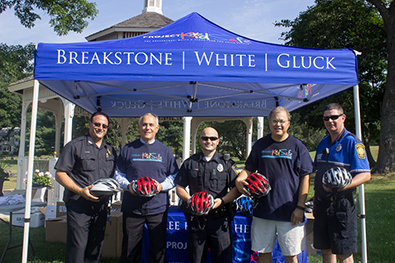 Since then, we have donated over 15,000 bike helmets to children across Massachusetts, with help from over 35 partners, including Massachusetts Safe Routes to School, Boston Bikes, Roll It Forward, CYCLE Kids of Cambridge, the Dedham Police Department (shown in the photo) and the Somerville Kiwanis Club. Several bicycle committees and more than 10 police departments have participated, including the Boston Police Department, the Cambridge Police Department and Quincy Police Department. Because the statute of limitations applies to bicycle accident cases, victims have a limited time in which to file their cases. If you feel you have a bike accident case, it is vital that you act immediately to protect your rights. 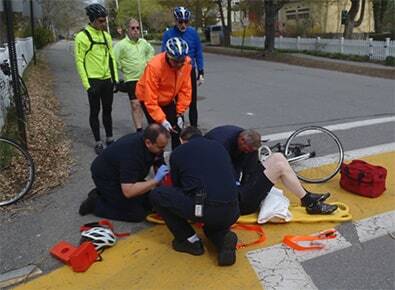 Please call the experienced Boston, Massachusetts bicycle accident attorneys at 617-723-7676 (or toll free at 1-800-379-1244), or use our contact form. We will be happy to provide you with a free consultation. Massachusetts bicyclists can protect themselves in the event of a serious injury by having adequate uninsured/underinsured motorist protection in their car insurance policies. Our attorneys answer some of the most common questions about the rights and responsibilities of Massachusetts cyclists under the law. 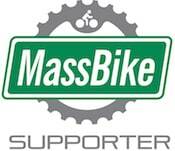 MassBike provides information about bicycling issues and advocacy in Massachusetts.